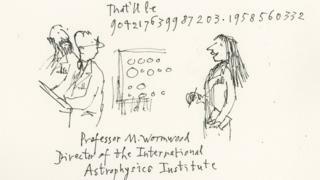 What would Roald Dahl's much-loved bookworm Matilda be doing today, 30 years after the book about her was published? 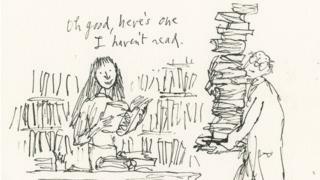 Illustrator Sir Quentin Blake has reimagined the heroine, who outwitted the vile headteacher Miss Trunchbull, doing what she might do best. 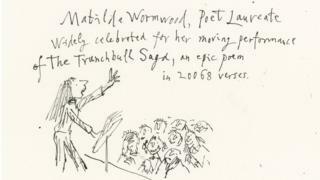 BBC News can exclusively reveal the illustration of Matilda Wormwood being depicted as poet laureate, "widely celebrated for her moving performance of The Trunchball Saga". We bet her special telekinetic powers come in handy for this! And we have no doubt that her brilliant mind will have no problem picking up new languages, as she travels the globe. Probably the best job for an avid reader. Matilda has sold 17 million books since it was first published, and eight million people have seen the award-winning Matilda the Musical. The novel was also made into a popular film in 1996. 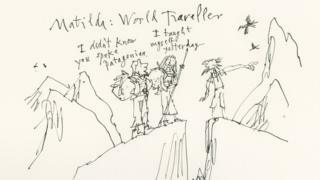 To mark the book's anniversary, the Roald Dahl Story Company also asked the British public what Matilda's life would be like now, including who she'd be friends with. The most popular answers included actress and activist Emma Watson, singer Ed Sheeran and the Duchess of Sussex. But don't worry, more than half of the survey predicts that she'd still be the best of friends with Lavender. 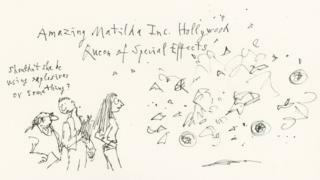 What do you think Matilda would be doing today?